« Rick Riordan is a Demigod! 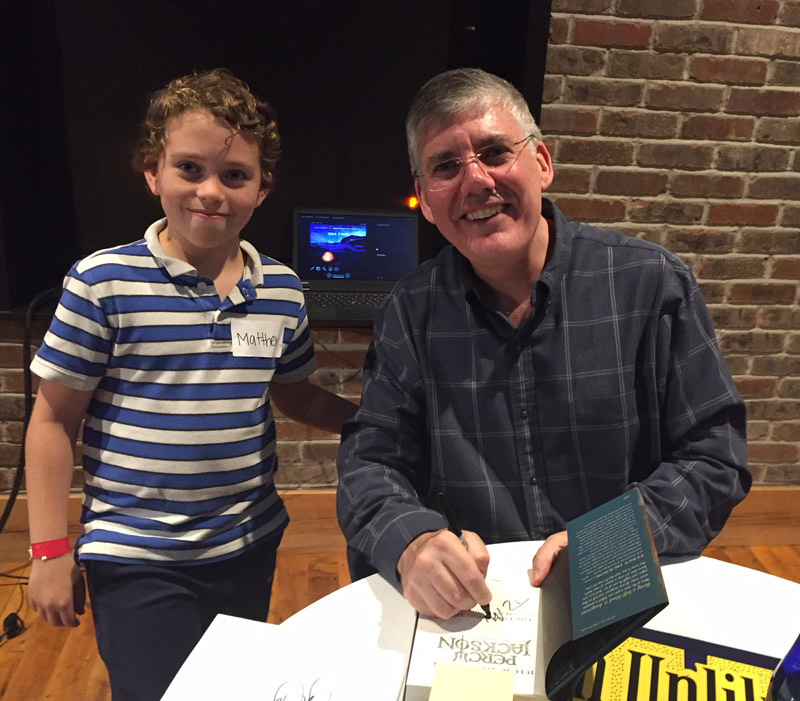 One child at a time, or sometimes en masse, Rick Riordan uses his superstar power to transform kids into readers. In a previous article titled Rick Riordan is a Demigod! the author’s ability to shazaam! a boy like Matthew from being a reluctant reader to an avid one was written in stone as if by Magnus Chase’s glowing sword. Well, there’s more to the story. This is about a tweet, some tickets, and an incredible bookstore. After that first blog post, the demigod author saw our WR article and responded to Matthew. Previously, Matt felt the demigod’s aura only through the printed page. Suddenly, though, Mr. Riordan had addressed Matt directly, through Twitter. Whoa. 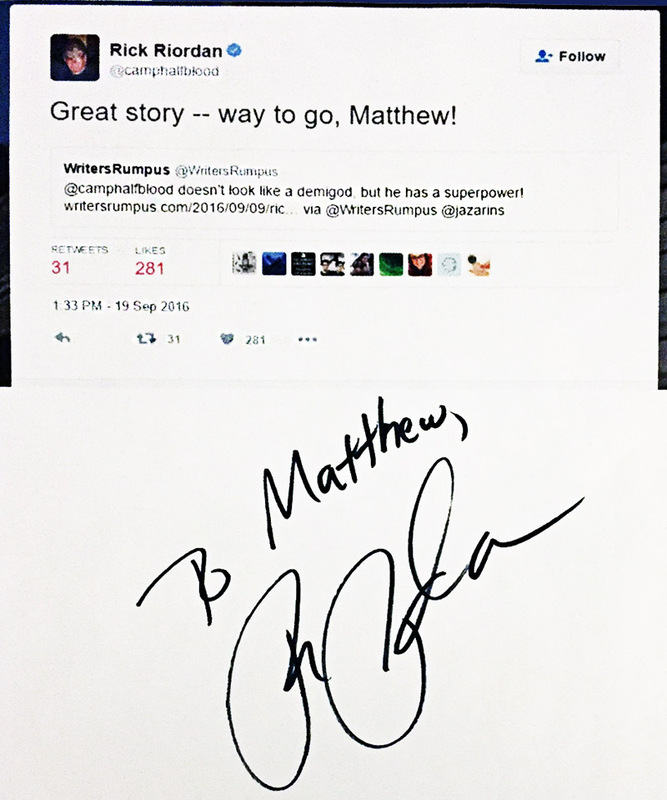 And later, during his book signing, Rick told Matt, “It is nice to meet you in person, Matthew.” Double whoa. Matt’s parents discovered that there would soon be a book signing not too far away at a bookstore called An Unlikely Story in Plainville, MA. Matt was dying to meet the demigod in person. For him, the books were roaring to life. Tickets were required. 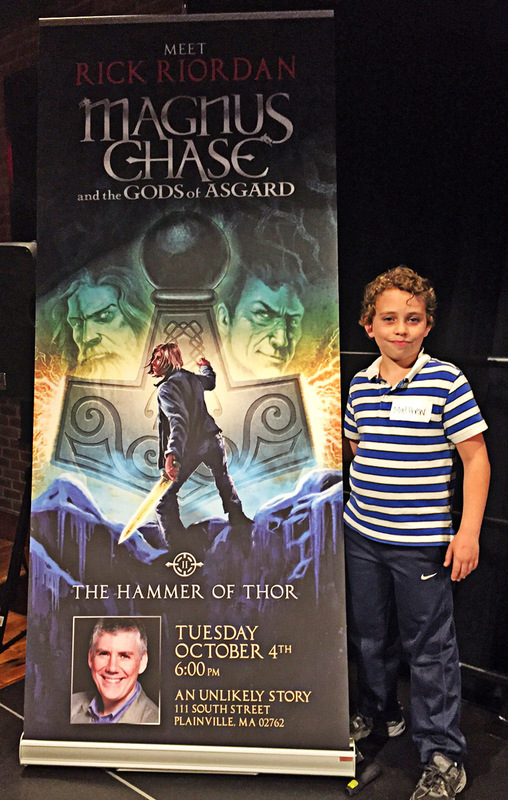 They cost $23.41, which would get you two seats and a copy of Thor’s Hammer ($19.99), the latest book in Riordan’s new Magnus Chase and the Gods of Asgard series. Matt’s dad Carl went online at the moment the tickets went on sale. Busy. Carl refreshed. Busy. He refreshed. Busy. In less than one minute all tickets for this event with a seating capacity of 200 had already been sold. Kym Havens, of An Unlikely Story, confirmed that three thousand people tried to get those tickets. Does that sound like trying to get into a Beyoncé concert? But this was at a bookstore! Fortunately, Carl did get Matt a spot on the wait list. When Matt and Carl arrived they stood in line at the back of the parking lot for 45 minutes and were given a number, which would determine what seat Matt would be given and his place in the book signing line. Good thing he’d been to Disney World for queuing practice! An Unlikely Story has a function room on the second floor called The Second Story and that’s where Rick Riordan did his PowerPoint presentation and answered questions for the 200 luckiest kids, while Matt and the other ninety-nine wait-listers were on the third floor watching on video. It was brilliant of the bookstore to offer this additional possibility. 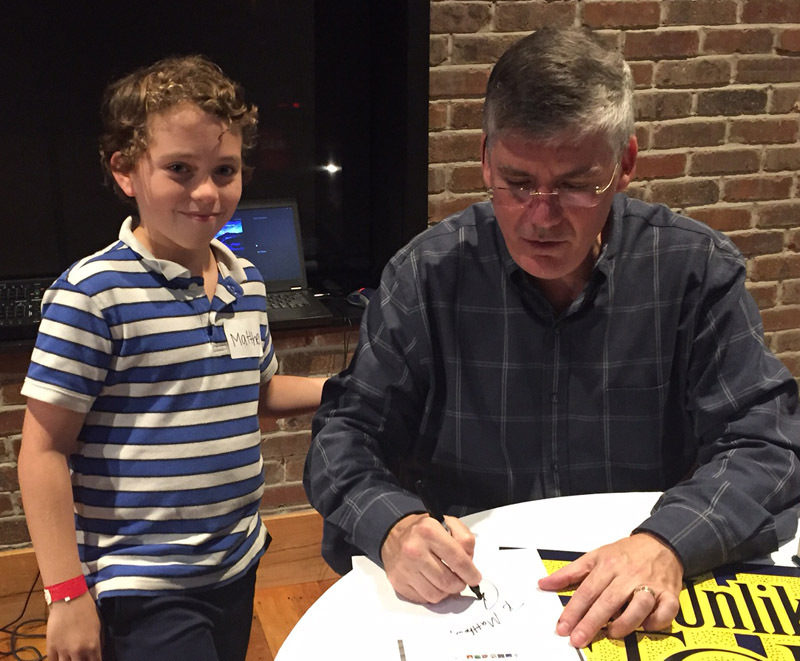 Before the presentation, Rick Riordan made an appearance to the wait-list kids and fielded two questions. Matt asked, “Who is your favorite demigod?” The diplomatic answer, “It changes based on the day and my mood, but tonight it is Leo.” What can be better for a kid than a one-on-one with his favorite author? Know who entertained the kids while they were waiting for Riordan to sign books? None other than Jeff Kinney of the Wimpy Kid series fame, who did his book presentation for them. Now that doesn’t feel at all like a consolation prize, does it. No, it was an incredible surprise! Wait. What? He and his wife own the bookstore? Oh, yes they do. No wonder it’s so cool. Matthew had met children’s book authors before, but he still hadn’t liked to read. One day his friend Sam told him about The Lightning Thief by a certain, now infamous, demigod author. Sam was not a reluctant reader. He was just spreading the gospel about a thrilling book series. Tons of kids like Sam love these 300-500 page books. The surprise is that kids with ADHD, dyslexia, and general malaise about reading will power through these hefty tomes too. How does this magic happen? As Matt was waiting in line to get his books signed, he spoke with six or seven other enthusiasts. One boy was formerly a seriously reluctant reader like Matt had been until he encountered the Percy Jackson books. Carl spoke with the mother of a girl who had been reading the Harry Potter books, but got bored and stopped. Now she’s happily reading about mythical battles between Riordan’s demigods and monsters. Matt met two girls, sisters, who have both ADHD and dyslexia, but slog through the Riordan books even though they are difficult because the kids in the books have the same disabilities these girls do. The characters are exactly like the girls (well in some ways), which amazes them. They can relate. So out of six or seven kids Matt spoke to, four had some kind of reading difficulty. These are not short, simple books. The first of the Magnus Chase and the Gods of Asgard books is set in contemporary Boston, which is also the Midgard of Norse mythology. That’s some mind-blowing cross-over. And Magnus Chase is a homeless teen with a reading disability who has done a bit of shady stuff, yet also a demigod with the power to defeat evil beings. There is we’ve-got-to-save-the-world drama throughout, offset by snappy humor, sometimes enough to make you laugh out loud. This recipe is converting kids of all reading abilities in droves. Like magic. Cue the bookstore. An Unlikely Story is an amazing facility. This bookstore provides authors and kids a fabulous venue, including presentation space, movie-style posters, an in-house famous author (Jeff Kinney who also has a studio on the third floor) to keep things running smoothly, and swag. Each of the wait-list kids was given an @camphalfblood related tee shirt. The bookstore offers a packed schedule of programs and activities for kids, and sometimes for adults too. And if all of that makes you hungry, you can have breakfast or lunch in their café. Mainly, though, they help authors like Rick Riordan cast good spells that encourage kids to read about ways to save this troubled world. Thank you, Rick Riordan! And An Unlikely Story!